By Melissa Lennig on February 5, 2017 24 Comments. This content contains affiliate links. As an Amazon Associate I earn from qualifying purchases. Has your child recently started earning a weekly allowance? Perhaps he or she is being paid for chores, babysitting, or received a generous financial gift from a doting relative? 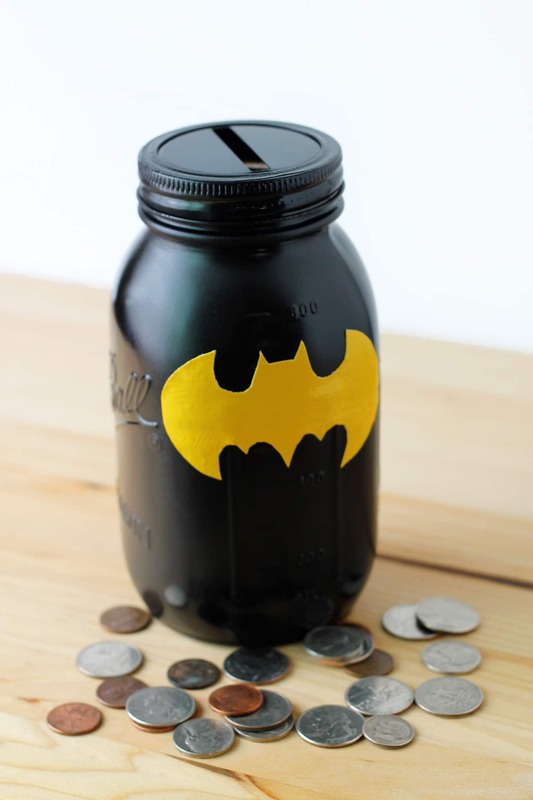 In this post, learn how to DIY a Mason Jar Superhero Bank to help your child learn about the importance of saving, spending, and donating their money. Do your children receive a weekly allowance? My husband and I haven’t yet implemented one, but have been considering it as our kids grow increasingly interested in money. They have figured out that Mommy and Daddy earn money through work, and that money pays for our needs and wants. A weekly allowance would be a powerful, hands-on opportunity for the boys to learn about saving, giving, and spending. 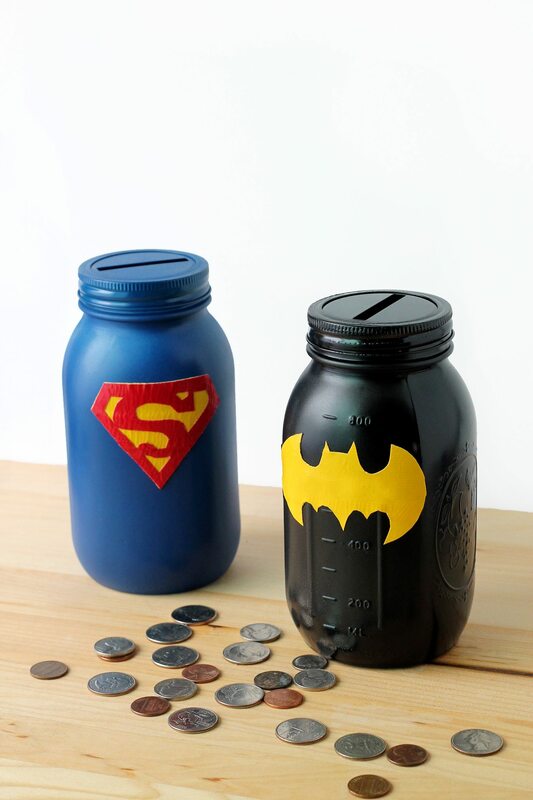 In the meantime, they’ve been saving Aldi’s quarters and couch cushion pennies in these adorable Mason Jar Superhero Banks. The banks chill on the kids’ dressers and are a cool accessory to their superhero bedroom decor. Every so often, one of the boys dumps their jar on the floor and sorts the change by size or color. If they don’t pick it up, I get to keep it, right?! My oldest son, who is learning to count money, is saving for a new Transformer. My youngest son is saving for Batman Legos. They both want to donate half their change to the Milwaukee Zoo to help feed animals. Want to get your kiddo saving too? Spray paint the jars and caps in a well-ventilated area. Allow the materials to dry completely. 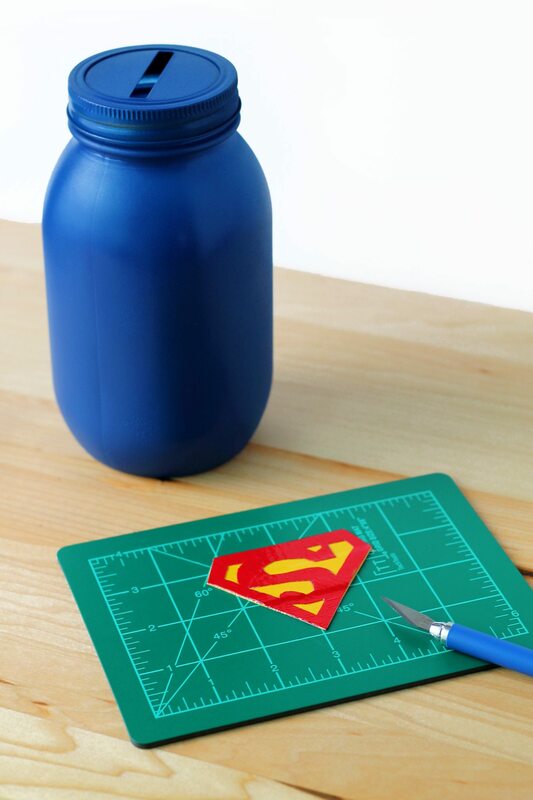 While your materials are drying, sketch the Batman and Superman emblems on duct tape with a pen (don’t worry about extra pen marks, as a cotton swab dipped in rubbing alcohol will remove those). If you lack artistic skill, print images off the internet, cut them out, and trace. Cut out the shapes with the X-ACTO Knife. I layered duct tape to create the Superman emblem (cut out the red shape first, then place it on top of the yellow tape). The duct tape will peel easily off the cutting mat. When the jars are dry, put the pieces together and center the emblems within the top third of the jar. 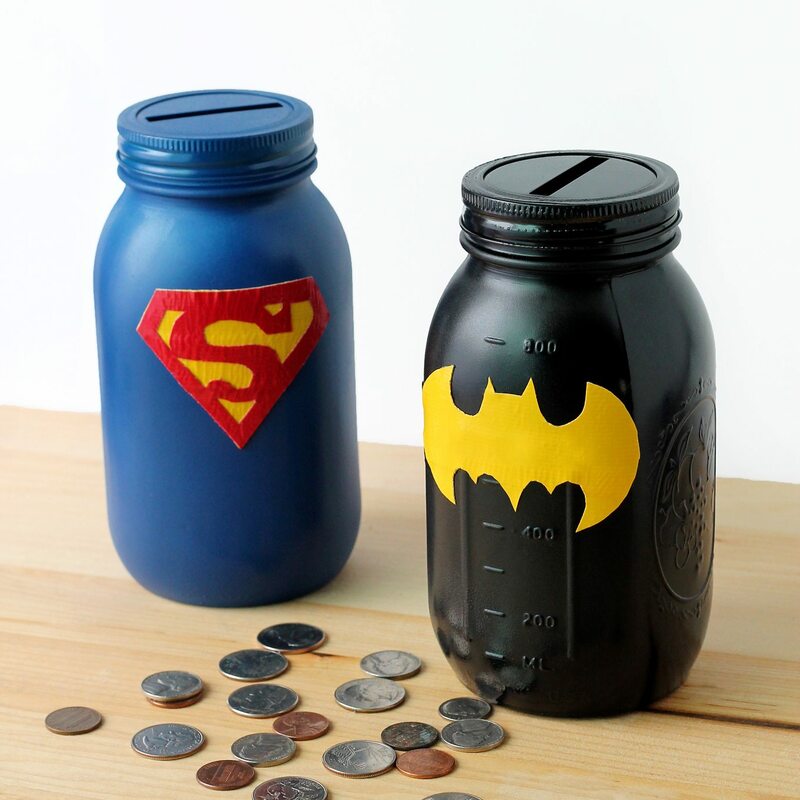 Share the Mason Jar Superhero Bank with a kiddo you love! I’d love to hear about how you’ve implemented allowance in your family. Share your best tips for teaching kids to save, spend, and share their earnings in the comments below. I love this idea to keep the saving safely and looking pretty and nice. I saw these awhile ago and plan on making a TMNT jar! 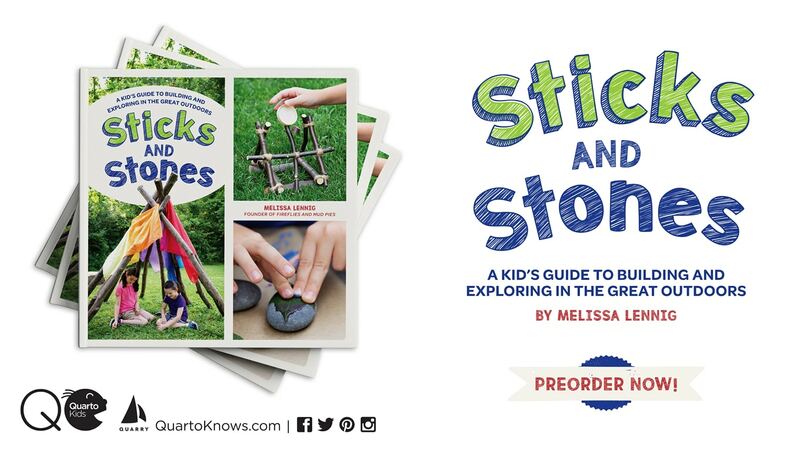 Really excited because my eldest child will be helping me since it’s for one of their friends as a “thank you” for being such a kind and giving friend. I will be modifying the spray paint to homemade chalkboard paint. I’m still unsure on whether or not to use felt for the mask and eyes, or to paint those on as well? Also, how did you manage to get such clean cuts on the top of the mason jar lid?? I worry about it being too sharp and may cut this section out, then place duct tape around the outer areas of the cut metal (maybe the entire insert metal portion), then paint. Maybe even glue a round green piece of felt? Make it bubble up a tad so it actually looks like the turtles head? Hmmm… Anyways, thanks so much for the idea!! I’ll let you know how it turns out. They aren’t cuts on top of the mason jar lid. I purchased coin bank lids, and they aren’t sharp. There should be a link to them in the post! Have fun!